Taking bicycles on trains during peak hours banned by rail operator Wessex Trains from Sunday. The company blames a sharp rise in passenger numbers for the ban, saying it has become problematic for them to compete for space with bikes. 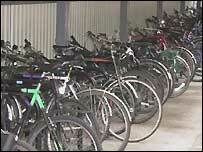 As a compromise Wessex has dropped charges for reserving cycle space during non-peak services. The order has been imposed on trains arriving in Bristol, Cardiff, Exeter, Plymouth and Truro. From Sunday some services will require a cycle reservation ticket, but only passengers holding a current season ticket can get one, and even that is subject to just two bikes per train. On all other services it is a first come first served basis with no reservation facilities. Bikes willl not be allowed at all on trains arriving in Bristol, Cardiff, Exeter, Plymouth or Truro between the peak times of 0700 and 0900, or departing from those stations between 1600 and 1800. The rules do not apply to folding bikes. Wessex Trains says the carriage of bikes has become problematic over recent years with foot passengers fighting with bicycles for adequate space.